A budget constraint occurs when a consumer is limited in consumption patterns by a certain income. When looking at the demand schedule we often consider effective demand. Effective demand is what people are actually able to spend given their limitations of income. Temporary budget constraints can be overcome by borrowing, but in the long term budget constraints are determined by income such as rent and wages. 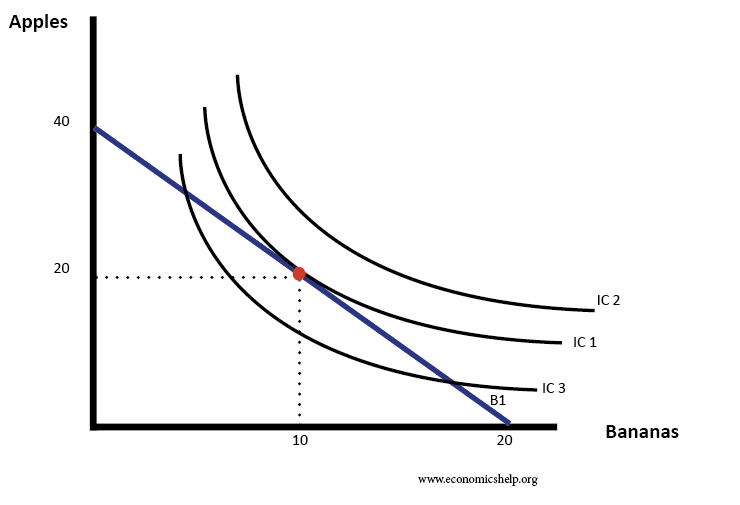 The budget line is B1 – this shows maximum consumption with current income. To maximise utility, the consumer can choose on IC1, 20 apples, 10 bananas. An increase in income would shift the budget line to the right.